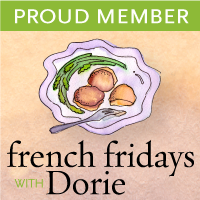 When I was done with this week's French Fridays with Dorie recipe, Shrimp and Cellophane Noodles, it looked nothing like I had imagined and probably nothing like what Dorie had in mind as well! First off, I don't eat shrimps, so I had to find a suitable substitute for that. Secondly, I grabbed the wrong kind of noodles in my rush to grocery shop this afternoon. Instead of glass or cellophane noodles, which is string-like and clear when cooked, I brought home a packet of flat rice-noodles instead. The mistake is forgivable (at least I hope so), the noodles were clear while uncooked and it never occurred to me to read the ingredients label properly. Rice noodles actually turn white and opaque upon cooking, unlike the transparent glass noodles. Okay, that was the very least of my worries. The other day, I had bought a box of fresh black fungus, not really knowing what they were or what to do with them. Then when I opened up Dorie's cookbook and did a little research on Chinese ear mushrooms. Whatddya know? They're also known as black fungus, and since I had fresh instead of dried ones, I could skip the soaking part and threw them straight into the cooking pan. Crunchy little things, these are... and really great additions to soups and stir-fries. I sliced them into strips for ease of consumption - especially the chewing part - because black fungus has a crunchy, chewy texture akin to bone cartilage. I kid you not! Black fungus - they remind me of crunchy ears! Labeled as a medicinal food for thousands of years and known for its rich nutrients such as iron, protein, fat, vitamins, polysaccharide, and other minerals, black fungus tastes neutral and is said to be able to replenish “Qi” (essential energy), enrich and activate blood, purify lungs and intestines, etc. Considered as a 'meat' in vegetables, the iron contained in black fungus is one the highest among all the vegetables; people who eat it regularly tend to be at lower risk of developing cardiovascular disease and have a normal blood viscosity - a similar result to the effects of aspirin. So a big Yay! to black fungus. I opted out from using the prescribed tomato sauce (2 cups...really?). Instead I roasted some tomatoes, peeled and chopped them up, then sauteed that along with the black fungus and tofu. Which reminds me, the tofu slices served as my prawn impostors. I simply sliced firm tofu into thin slices and deep-fried them before tossing them into the tomato and mushroom 'sauce'. These noodles were pretty cool... they do nothing to remind me of French food, of course, but that's beside the point! Spend the weekend doing something beautiful, that's my wish for you! Helloo....and Happy New Year!! Yes, I know everyone all over the world said that over 3 weeks ago but I haven't blogged since November last year, so better late than never :). This month is the first time our newly revamped cooking group, the Creative Cooking Crew (CCC), is making its appearance. Our CCC hosts are Lazaro of Lazaro Cooks and Joan of Foodalogue and our challenge this month is to showcase Vegan food in a totally creative way, right up my alley! I've featured many vegan posts in my Instagram gallery (@divaeatslife) but sometimes the recipes just get lost within the folds of my memory... You see, the beauty of IG is that it's not a blog and therefore recipes are usually ad hoc because there's no real need to elaborate on the 'how to' of the food pictures being posted up there. Occasionally though, I do make an effort to record my recipes properly, and this is one of them. A friend recently challenged me to make food that can be served without any plates, bowls, cups or any serving utensils, so that's what you'll also notice here. An improvized plate made out of screwpine (pandan) leaves and bowl out of a small pomelo lime shell. For the skewers, I used lemongrass stalks and simply wrapped the paste-like batter around them corndog style. I think I must've have pushed my creativity boundaries to the limit (there is none, really...lol) with this one, but I'm happy with how everything looks and tastes here! The texture of the tofu skewers is lightened with the creaminess of the ground chickpeas, and its flavor enhanced with my seasonings of choice - fresh lemongrass and Za'atar powder. You can also use cayenne pepper instead of Za'atar if you're not feeling so adventurous. In this cooking group, though, being mainstream is the last thing you'd want to be because everyone else is fearlessly creative and there is nothing - foodwise, at least - most of us are unwilling to try! There will be a round-up of the CCC's vegan offerings on January 30 over at Joan's blog. Head over there then, won't you? 1. Blend all ingredients except lemongrass skewers in a food processor and process until it becomes a thick paste. 2. Scoop a heaped tablespoon of paste and wrap it around the thick end of the lemongrass skewer. Form into a sausage shape along the skewer. Wet your palms and fingers in between each shaping so the paste/dough doesn't stick. Place tofu skewers in the freezer to chill for at least 10 minutes. 3. Heat some oil in a deep pan under medium heat. Gently lower the skewers into the oil and fry until golden brown. Drain excess oil on paper towels and serve immediately. 4. For the dip, place all the ingredients in a bowl, give the mixture a good stir and serve immediately with tofu skewers. I'm making an appearance after a few weeks of absence to bring you a very special post today. My friend Faith Gorsky from An Edible Mosaic just had her first cookbook released, entitled An Edible Mosaic: Middle Eastern Fare with Extraordinary Flair. I’m incredibly honored and excited to be participating in her virtual book launch party and sharing a recipe from the book! The book has over 100 Middle Eastern recipes, with a focus mainly on dishes from the Levant, but also a few recipes from other areas of the Middle East. Faith has a pretty unique story…after getting married, Faith spent six months living in the Middle East, where she fell in love with the culture and cuisine. Subsequently, she returned four more times for visits, each time delving deeper into the cuisine and deepening her passion for and appreciation of the region. Recipes in her book are authentic Middle Eastern (taught to Faith mostly by her mother-in-law, Sahar), but streamlined just a bit for the way we cook today, with unique ingredients demystified and cooking techniques anyone can follow. 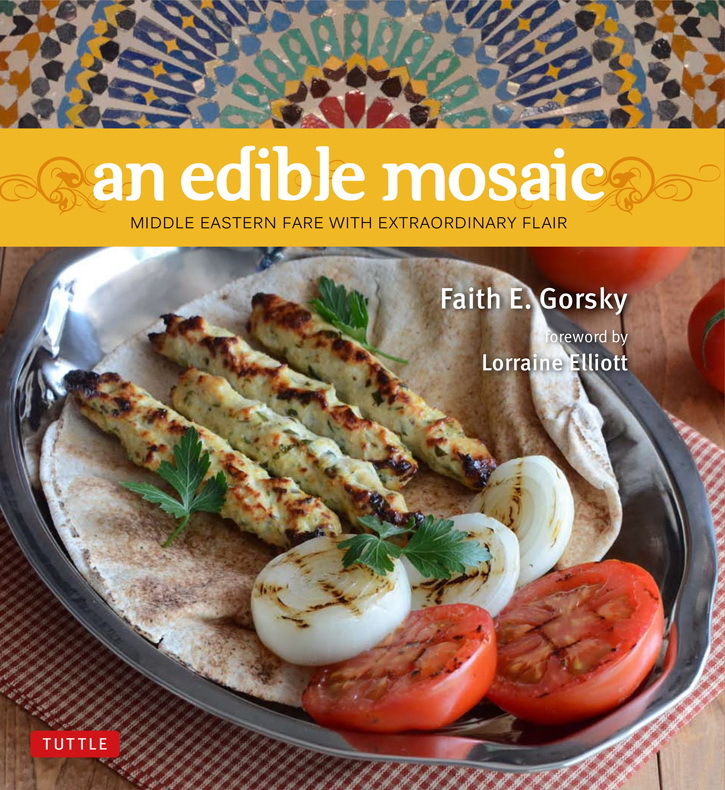 If you didn’t grow up eating Middle Eastern food, it can be a difficult art to master; Faith understands that, and explains complicated dishes in an approachable, easy-to-follow way. The book is available to order now on Amazon and Barnes & Noble! 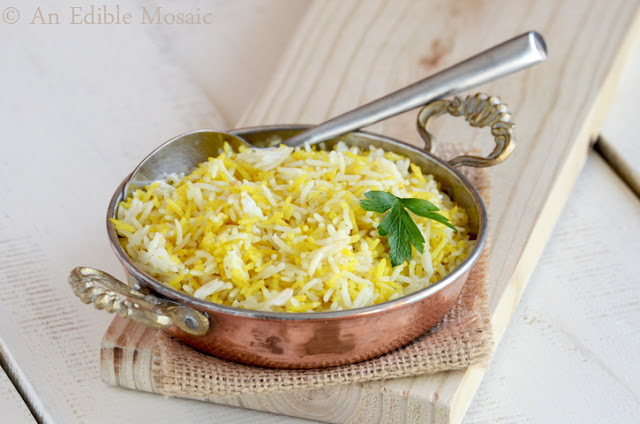 The recipe from the book that I’m sharing with you today is for Saffron Rice with Golden Raisins and Pine Nuts, along with a variation for Mixed White and Yellow Rice. I actually made my own version of this dish above using her suggested spices of cardamom, cloves and cinnamon, while substituting the pine nuts with almonds. It was very simple to prepare, yet was deliciously fragrant from the addition of the spices. The nuts and raisins also added a welcome texture and sweetness to the dish. The recipe is vegan so you won’t have any trouble incorporating it into a vegan or vegetarian meal, but it is just as delicious served with chicken, beef, lamb, or seafood, and it would be really fantastic with just about any curry dish. I decided to serve mine with a tasty Squash and Okra Curry and in the cookbook, Faith recommends pairing this rice dish with Shrimp in Aromatic Tomato Sauce. 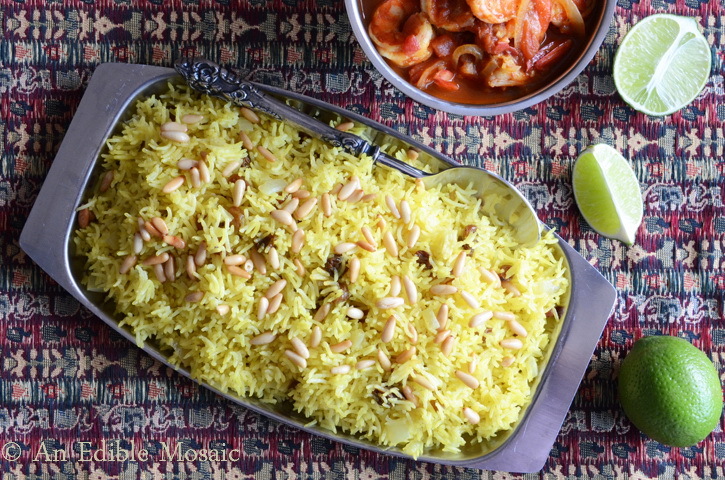 Saffron Rice with Golden Raisins and Pine Nuts, Pictured with Shrimp in Aromatic Tomato Sauce, from An Edible Mosaic: Middle Eastern Fare with Extraordinary Flair. I won't flatter myself by assuming that some of you might remember me, but I've been here awhile, I've also been gone awhile. Over the past few months/weeks, I had experienced the loss of several people closest to me, but on the other side of the coin, I had also been doing fun new things like getting fit, running races for charitable causes and cooking things up on Instagram (without having to blog for it, I know...how awful). But I'm back. Hopefully to stay a while longer. 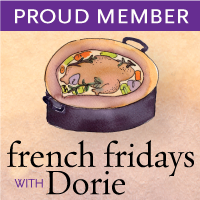 And this time, it's just to make a simple hummus for French Fridays with Dorie's weekly assignment. Oh, how I have missed cooking as part of this group! 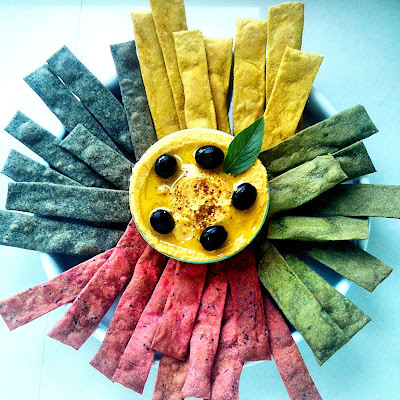 Hummus won't be the very first thing we would think about when musing over French cuisine but according to Dorie, it had wiggled its way into the Gallic repertoire of dips alongside tzatziki and guacamole. And really, this Middle Eastern-inspired dip is nothing more than a simple and quick blending of chickpeas, garlic, tahini, lemon juice, cumin and seasonings in the blender. I added cooked carrots and Thai chili flakes to mine to switch and kick it up a little. I also made very simple wholewheat crackers in four different flavors - matcha, black sesame, dragon fruit and mango - to go with the delicious dip. They make for an attractive and tasty addition to a hummus platter, so do try these next time you're inviting people over. Apologies for the picture quality on this post, I actually made the hummus and crackers a few weeks back and shared them on Instagram. The pictures were taken on my iPhone and not quite up to blog posting quality, but oh well, I hope you can still see how lovely it all looked put together. I have the soulful Anthony Hamilton playing in my ear while I'm typing this post up, so let me share what's in my head (and heart) with you on this lovely Friday. Hope you'll all have a beautiful and peaceful weekend ahead! 1. 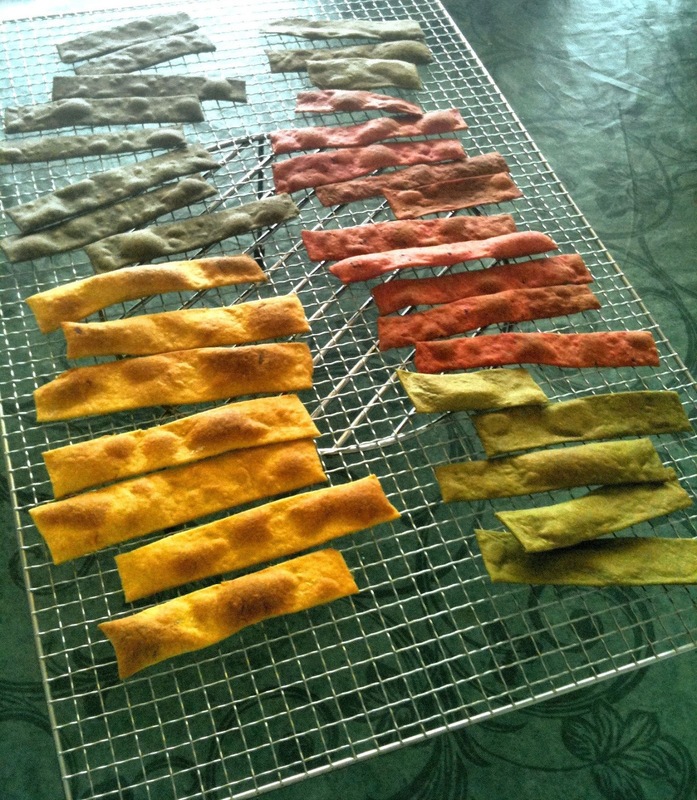 For each flavor separately, place dry ingredients in a bowl and add olive oil to this. Rub flour with fingertips until you get a breadcrumb texture. 2. Then add water or fruit puree gradually and knead until a pliable and slightly moist dough forms. With a rolling pin, roll each dough very thinly and cut into strips with a pizza cutter. 3. Bake in a preheated oven at 325C/175F for 15 minutes until crisp. Once cooled, store in airtight containers. I am my best work... a series of road maps, reports, recipes,doodles, and prayers from the front lines. I made this for lunch recently and really hadn't planned on posting this recipe up on the blog, but sometimes life doesn't always let you have your way. What actually happened was, I had taken some shots of this dish using my iPhone and uploaded a picture onto Instagram just to share what I was eating with the bunch of people there (as one does). The number of inquiries I subsequently received about the recipe got to the point that I decided that well, maybe it was just better to record it on the blog so that everyone who wanted it could easily refer to it here. So here we are, a coincidental blog post! I must say, I am fascinated by Chermoula sauce, which is typically used as a marinade for fish in Morocco and the North African region, but can also be used as a stuffing or sauce. Its uses are endless, apart from being a marinade, you can also serve it over roasted vegetables like squash, potatoes, chickpeas and like in here, I chose to spoon it over roasted eggplant and beetroot. There are a number of variations of Chermoula. Some use only cilantro while others include parsley, while I used both (what the hell, just live a little!). Some use preserved lemon, while others prefer just the fresh juice; then you can use powdered ginger, but I used fresh; and use smoked paprika as opposed to regular paprika. Just feel free to adapt it to your mood and what you have available. The best thing about Chermoula is that it requires you to do nothing more than put all the ingredients in a mini-food processor and blend them until you reach the desired consistency. Ideally, this should be still a little rough, not fully pureed. It will taste even better if you make it an hour or so in advance to let the flavors develop. The traditional way to blend Chermoula is in a mortar and pestle, apparently the result is incomparably better than anything made in an electrical blending gadget. But I wouldn't know because I was too lazy to work my arm muscles out the day I made this. 1. Combine all ingredients in a mini-food processor, spice grinder, or mortar and pestle. Process until a thick, moderately rough sauce is formed. Set aside, covered, for one hour before use. 2. In the meantime, preheat oven to 350F/180C and prepare the vegetables and garnishes. Cut eggplants and beetroot into 1/2 inch thick slices and brush both sides with olive oil. Place on a lined baking sheet and roast for 20-25 minutes until softened but not dried. remove from oven and set aside. 3. Warm up a skillet over medium heat and carefully toast the roasted vegetables until crisp on the cut sides, about one minute each side. Leave to cool before plating. 4. Stir the Chermoula sauce and spoon or drizzle on top of each vegetable slice. Garnish with orange, cilantro and pumpkin seeds. Serve immediately. For this challenge, I really wanted to do a spin on classic British desserts. The first one that came first and foremost to my mind was Bakewell Tart, a buttery tart with a slick of bright raspberry jam underneath a toasty baked almond frangipane filling, originating from Bakewell in Derbyshire. The only thing was, I didn't feel like baking a tart, as visions of substituting butter with something else for the crust just didn't appeal to me. I decided to use filo (phyllo) pastry dough instead to seal the almond and raspberry flavors in and glaze it with lemon-scented confectionery sugar. I've seen some individual-portioned Bakewell Tarts being topped with half a cherry but I didn't have any so I made do with cranberry. The second sweet treat I opted to make was based on a modern British 'classic', Sticky Toffee Pudding, sometimes also known as Sticky Date Pudding. It's a steamed dessert consisting of a very moist sponge cake, made with finely chopped dates or prunes, covered in a toffee sauce and often served with a vanilla custard or vanilla ice-cream. Since I was on a roll with the filo, I thought well why not capture the flavors of the pudding using filo too? You could use luscious Medjool dates for filling the toffee pudding purses, but I had these yellow dates on hand. I used the browned, soft and ripened ones instead of the fresh yellow ones as the latter are not as sweet and can even be slightly tart. For the filling, I blended toasted cashews with the ripened dates and added elements of cinnamon, nutmeg and ginger to enhance the sweet flavor. I made a vegan toffee cream sauce to accompany the parcels out of vegan butter, dark brown sugar and cashew cream. The purses were baked and each one placed in the center of its own pool of thick toffee sauce. So it was all a matter of dip, bite, dip and bite until all the crisp and crumbly morsels are finished...and then you reach out for another one! If you've ever lived in the United Kingdom, you'd be forgiven for thinking that the British reach out for their 'cuppa' every time they need to destress or resolve life's dilemmas. Well, you won't be far wrong. Having a bad day? Let's brew some tea. The weather's cold and wet... here's a cuppa to warm you up. Your favorite football (or soccer) team lost, or your sweetheart/handyman/publisher (insert relationship preference here) just let you down again... grab this cuppa in between your palms and tell me all about it. Feeling all posh and Fancy Nancy? What are you waiting for...let's head off to high tea! 1. Preheat oven to 180C/350F. Place almonds, sugar, zest and oil in a small food processor and process mixture until it forms into a moist and pliable dough. 2. Cut filo dough into 7 X 2 in strips. Place half a teaspoon of raspberry conserve on one end of the filo strip. Top this with a teaspoon of almond mixture, flatten slightly for easier folding. Take one corner of the filo strip and fold it over the filling into a triangle shape. Continue folding down the length of the strip, samosa-style, and seal the end with a dab of water. 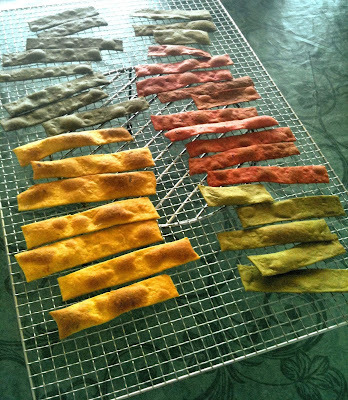 Do this with all the strips and place them on a parchment lined baking sheet. 3. Bake in the oven for about 20 minutes until they are golden brown and crisp. Leave to cool for 5 minutes. 4. To make the glaze, sift confectionery sugar into a small bowl. Add lemon juice gradually to get a thick glaze consistency. Dip one side of each samosa in the glaze and place a cherry half on top. Leave to set before serving. 1. Preheat oven to 180C/350F. To make the filling, process nuts, spices, vanilla and dates until it becomes a moist dough. Take a heaped teaspoon and roll into a packed ball in your palms. Do this with the rest of the dough. 2. To make the purse, take a ball and place it in the centre of a filo square. Brush the filo just around the ball area with a little water to help seal it. 3. Take 2 opposite corners of the sheet and bring them together. Do the same with the remaining two corners. Wrap filo around the ball circumference and twist to seal. Tie filo ribbon along the twisted part to secure further. 4. Bake in the oven for about 20-25 minutes until the tops are golden brown and crisp. Leave to cool for a few minutes before serving. 5. For the toffee cream, blend the cashews with water to form a thick cream. Strain though a fine sieve and set aside. 6. Melt the vegan butter and brown sugar in a pan, then add the cashew cream and bring gently to the boil. Leave to simmer for a few minutes on low heat until it reaches the desired consistency. Add more water if the sauce is too thick. 7. To serve, spoon a teaspoon of toffee cream on an individual serving plate and place a Sticky Toffee Pudding Purse on top. Serve immediately. I tried to write this post for two days, but no clever words came. It's already Sunday now, and still no smart or funny prose, but I'm going to go ahead and write this anyway. Show up. Shine. And let it go. That's just become my mantra for my high expectations :). 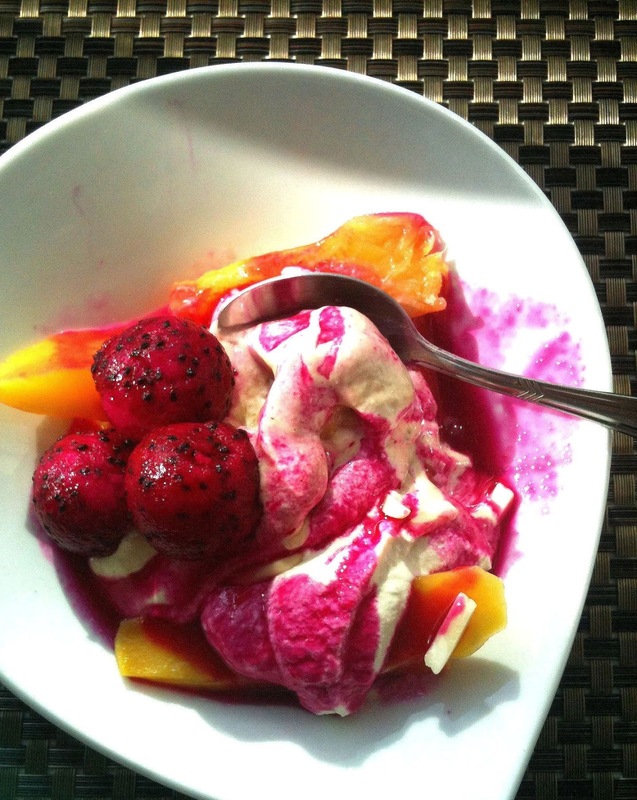 So it's good old Peach Melba for this week's French Fridays with Dorie. A special occasion marking our 100th recipe assignment (although I must confess that I've done only a paltry number out of the 100). It's a remarkable milestone and although I joined this online cooking group quite late, in April 2011, I've been welcomed with open arms by everyone. This is a global community of warm, supportive, witty and brilliant cooks/bloggers and we all have something new (cooking or otherwise) to learn from each other every week. Words cannot adequately describe how much I adore my fellow Doristas! So yes, the peach melba. My version is a vegan, tropical twist to the one Dorie originally had in mind (apologies again, Dorie). Peaches and raspberries are not the easiest fruits to get over here, and even when they do appear in the stores, they're no longer bursting with freshness. So I resorted to using whatever fruits we currently have in season and abundance. My mango tree is currently blooming, I picked them three-quarters ripe - if they are left to ripen on the tree, the monkeys and bugs will devour them before we do (just in case you were wondering) - and used a slightly underripe mango to simulate the peach. Its firm texture is excellent for poaching with vanilla, yet it's sweet enough not to have to add any extra sugar to the poaching liquid. The raspberries were substituted with dragon fruit balls I scooped out with my trusty melon baller. You simply stick that gadget into any soft fruit, give it a little twist, and it instantly makes any fruit look whimsical. The rest of the fruit with the holes in it got turned into a delicious smoothie, so nothing was wasted. For the ice cream, I simply employed the easy vegan trick of blending completely frozen banana slices. To make it a bit more creamier, I soaked a handful of raw cashew nuts in water overnight, drained and blended them to make a thick cashew cream. Then I added this to the frozen banana in a powerful blender and blitzed it into ice cream consistency. In this hot weather though, my 2-ingredient ice cream quickly turned to soft serve, and gave me a hard time to photograph it and make it look anywhere near good. I'm also going to mention that I had been well-organized enough to have made last week's Cafe-Style Grated Carrot Salad, but disorganized enough to have not posted it up. I decided to make carrot ribbons instead of grating it, the advantage being that the ribbons hardly 'wept' and the salad held its form much longer after adding the mustard vinaigrette dressing. Instead of raisins, I added sliced soft, dried figs for that bit of sweetness required to cut into the tangy and savory salad. A sprinkling of toasted walnuts and cilantro completed the dish. Although it might not be truly French-style, I hope I will be forgiven by the French when I say that this was as equally delicious as their traditional version. So last week was the start of Eid in Brunei and marked a month-long celebration with many gatherings amongst family and friends, and plenty of food. Like with any festivity, it's the children who enjoy it the most because it's probably the one time in the year when they have permission to go on a (fairly unrestricted) sugar high from feasting on all the lovely and colorful cakes made especially for Eid. Most of the traditional food served during Eid is non-vegan, so for the first time, I found myself at the sidelines, just watching people eat while I stuck to my greens and fruits. The upside was that for once, my waistline measurement didn't budge and my stomach didn't groan and over-react from eating all that rich food. Here I share with you a few shots of my family and friends on the first day of Eid. Clockwise from top left: With local DJ and close friend, Frankie; Greek family friends; good friends from Dubai who returned home for the week, and local cookies.